The 62-acre Pelizzari Natural Area is a mix of woodlands, meadows, wetlands and shoreline in the southern end of Peninsula Township. 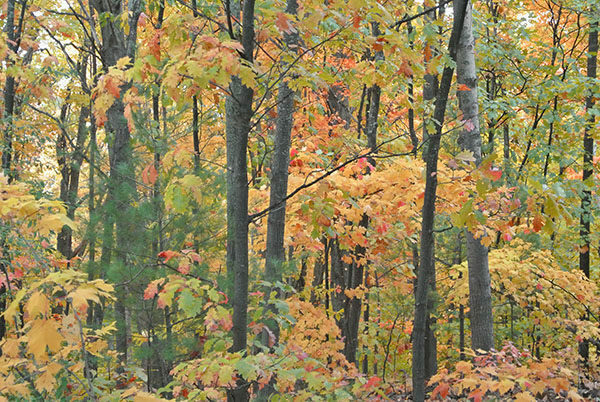 Remnants of the farm fields and orchards are still evident, but Pelizzari also includes upland hardwood forests that are dazzling in the fall, giant hemlocks and resident foxes who make an appearance every now and then. The main feature of the natural area is the 3.2 miles of trails that wind through the forests and fields and enjoyed by enjoyed by hikers, birders, skiers and snowshoers. Old Mission Peninsula, which stretches 18 miles from the heart of Traverse City to the 45th Parallel, was covered by white pine, beech, maple and hemlock forests when Rev. Peter Dougherty arrived in 1839 to establish a Presbyterian mission for Chippewa and Odawa Indians. Those that followed him discovered the finger of land was ideal for growing fruit and eventually vineyards and orchards replaced the forests. In the 1970s a housing boom changed the landscape again as more than 100 subdivisions popped up among the farms and vineyards. Today a string of natural areas and parks provide glimpses into what the peninsula looked like a century ago or even more. 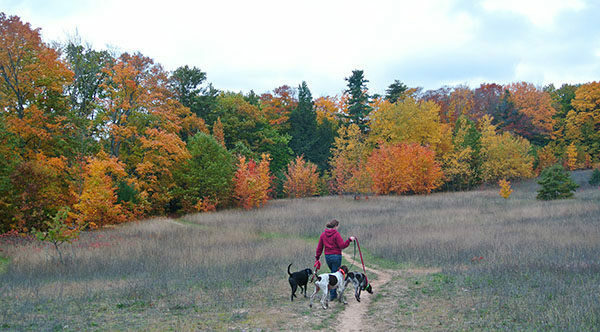 Pelizzari Natural Area, only 2 miles north of Traverse City’s busy US-31 corridor, is one of them. The park was settled in 1920s when Gene Pelizzari’s parents arrived from Italy and purchased 80 acres to grow cherries, apples, plums and grapes. Gene took over the farm in 1954 and worked it for 32 years before selling it in 1991. By the end of that decade subdivisions had surrounded the fields and forests of the Pelizzari farm and a movement began to preserve the land as open space. 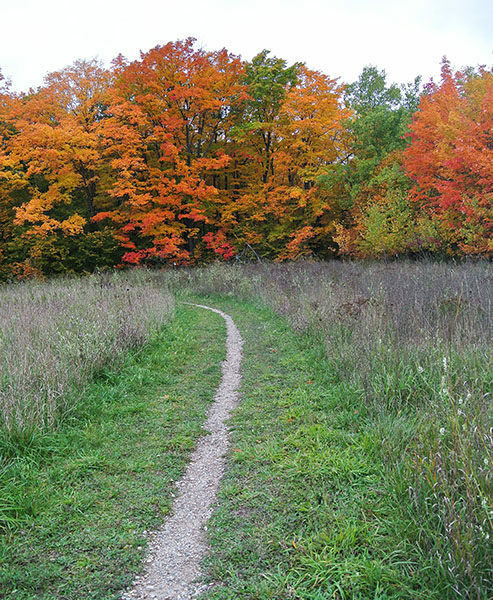 With the assistance of the Grand Traverse Regional Land Conservancy, a millage proposal was put before the Peninsula Township residents in 2008 to purchase park land. After a sometimes heated campaign, the millage was passed by more than 60 percent and the following year Pelizzari Natural Area was purchased and dedicated. The 62-acre park is a mix of woodlands, meadows, wetlands and shoreline in the southern end of Peninsula Township. Remnants of the farm fields and orchards are still evident, but Pelizzari also includes upland hardwood forests that are dazzling in the fall, giant hemlocks and resident foxes who make an appearance every now and then. The main feature of the natural area is the 3.2 miles of trails that wind through the forests and fields and include several crossover spurs. The trail described here is the perimeter of the system, a 2.8-mile loop that is enjoyed by hikers, birders, skiers and snowshoers. Mountain biking is not permitted in the preserve. Numbered posts at Pelizzari follow a counter clockwise direction and from the trailhead on M-37 you begin on the Old Orchard Field loop within view of subdivisions and homes. But post No. 1 is reached at Mile 0.3 and from there you make a long decent into Middle Woods, a forested ravine of some surprisingly large hardwoods. The sudden change is amazing. Post No. 3 is reached at Mile 0.6 and marks where you enter the Lower Meadow. A right at post No. 4 and then No. 5 leads you to the quarter mile Hemlock Forest Loop where the largest pines are seen in the cool lowland area. You return to post No. 5 at Mile 1 and then climb past post No. 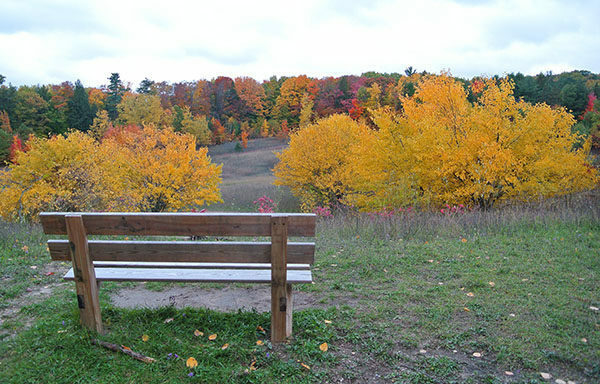 7 to a bench with a nice view of the forested hills surrounding Lower Meadow. If it’s a nice day in early October you could spend an hour here taking in the fall colors. A sharp downhill to post No. 8 leads to the 0.7-mile Upper Field loop. In late fall and winter you can view East Grand Traverse Bay at one point before returning to post No. 7 at Mile 2.1. The steepest climb of the day is encountered after post No. 12, followed by another descent through the intriguing Middle Woods. Post No. 13 is reached at Mile 2.5 and from there you’re only 0.3 mile from returning to the trailhead, passing a bench along the way. There is parking and an information kiosk at the Pelizzari Natural Area trailhead. 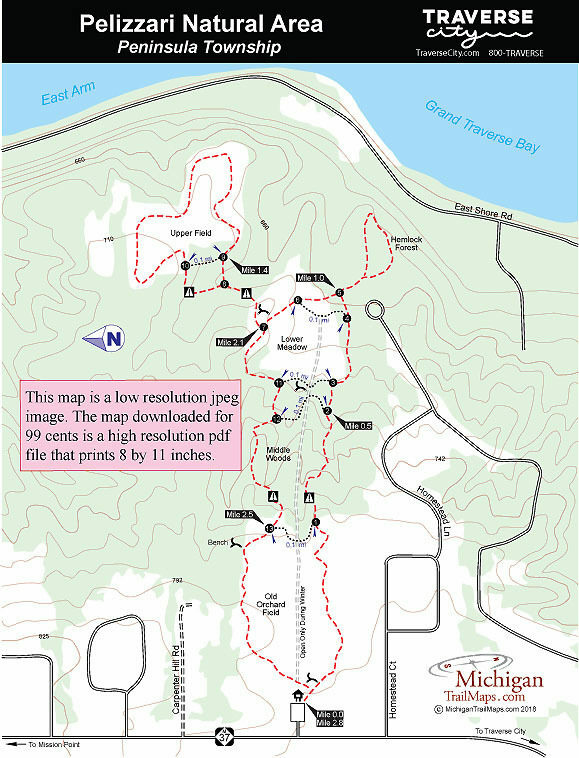 Pelizzari Natural Area is open year-round, closing daily at 10 p.m.
From US-31 in Traverse City, head north on M-37 and the posted entrance of Pelizzari Natural Area will be reached in 2 miles.